What's the laziest thing you've done in WoW? What’s the laziest thing you’ve done in WoW? Sometimes, there are days when you just don’t feel like putting forth the effort, in-game or out. People get really creative when it comes to being lazy, even in World of Warcraft. Matticus posed a question on Twitter the other day — what’s the highest level of lazy you’ve reached in WoW? He cited using the Flight Master’s Whistle just to get to the flight master directly above him, because he didn’t feel like riding up the side path to get to them. Honestly, I’ve done the same thing — and I’m guessing we’re not alone. I’ve been known to happily take flight paths rather than flying directly to an area, just because in that minute or two of flight, I can alt-tab out of the game and look at something else. But I’ve also been lazy in other ways as well, some requiring more initial work than others. I managed to kit out my first level-120 character via the Auction House, partially because I had a lot of gold left over from Legion, but mostly because I didn’t feel like indulging in a pile of World Quests to gather gear. If I didn’t have that stockpile from the previous expansion, I couldn’t have done it — but Class Hall missions were exceptionally kind to me in Legion, so I had a surplus. I’ve also retained a stockpile of pretty much every teleportation item offered in-game, going all the way back to the Blessed Medallion of Karabor in Burning Crusade. I don’t play a Mage, but if I need to get somewhere in a hurry, chances are there’s something in my bank or my Toy Box that will get me really close to where I need to go. Before the advent of the Toy Box, that meant I had a lot of random items taking up space in my bank and my bags — but to me, it was worth it. I think, however, that pesky Flight Master’s Whistle affords a level of peak laziness like no other. Being able to just call a gryphon and get whisked away to a flight master is great. Picking the perk that teleports you to your capital city when you use the whistle next to that flight master? That’s even better. And there are days where I will AFK and just wait for the cooldown on the whistle, even if it would arguably take me less time to ride to where I need to go. But that’s me — and while Matticus and I have our own levels of lazy behavior, I’m pretty sure there are greater depths to be plumbed. 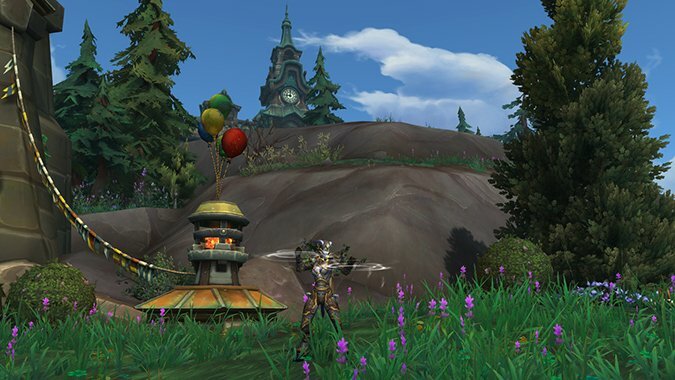 So I’ll turn that question over to you guys — what’s the laziest thing you’ve done in WoW? Are there any ridiculous shortcuts you take while you play? I mean, I get pretty lazy at times, but I could always use some new recommendations.